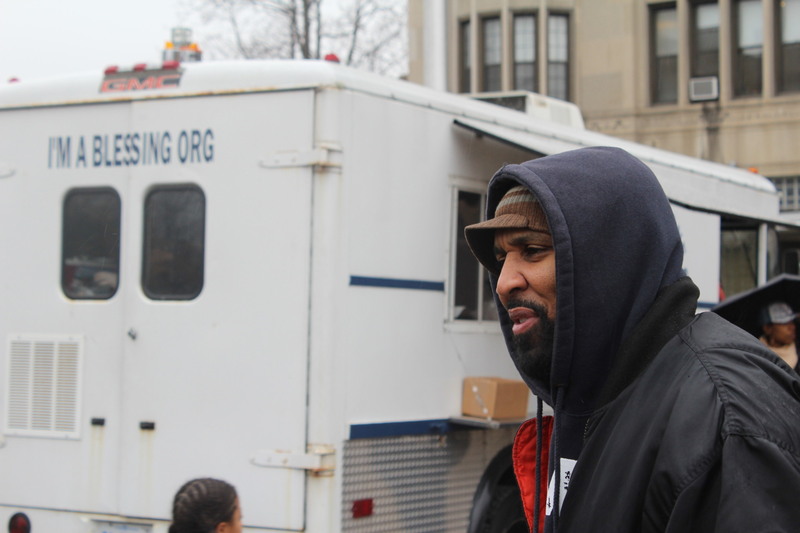 Detroit Jerry Boykin feeds the homeless and less fortunate every Wednesday from his food truck. Henry’s Ford’s assembly line has nothing on Jerry Boykin’s assembly line. Every Wednesday, he parks his food truck near the corner of Woodward Avenue and Peterboro, known to be a homeless haven, to feed and clothe those in need. One volunteer passes out the chips and fruit, another gives away pizza and sandwiches, and at the end, clothes, underwear, socks, and other goods are given away. And when he and his volunteers are done there, they head over to the Rosa Parks Transit Center downtown to be a blessing to those waiting for their bus. It is all a part of his “Free Lunch Wednesdays” campaign, through his We Are One Community Unity grassroots outreach program. Boykin, who grew up on Detroit’s west side, and attended Mumford High, pulled his inspiration to help the city’s homeless and less fortunate from when he first did it as teenager. Boykin does his service to the community in two areas of the city where private development is booming. On Woodward and Peterboro, one side of the intersection has seen an influx of pricey lofts and restaurants erected. On the other side, the homeless population is very visible, loitering and panhandling at the check cashing store and Detroit One Coney Island. The homeless population is going uncared for during Detroit’s resurgence and it is caring citizens such as Boykin who are filling the void. Before Boykin arrived in his truck, there was line of people waiting on him on Woodward and Peterboro. At the transit center, the people were glad to see him because some had not eaten in days. Even the bus drivers stopped by on their breaks to grab some hot chocolate and a granola bar. The people know Boykin’s name and he knows theirs. The same goes with his volunteers. To them, Free Lunch Wednesdays is more than just giving away food to people you do not know: it is a family gathering. Boykin and his volunteers wear shirts and hoodies that read “I’m A Blessing” on the front. That is his movement, in a subliminal kind of way. The message is not about the person wearing the shirt, rather the work they are putting into the community. Boykin said he does not plan out his Wednesdays. He puts the word out on social media and people show up with food and other donations. That is how far his reach and impact is and he has truly become a blessing to the homeless community in Detroit. What began with Boykin feeding just a few people out the trunk of his car, has grown to feeding hundreds of people from his food truck, physically and spiritually.